If you have ever slept in a chair at an airport because your flight got delayed, then you know the value of a best travel pillow. These pillows can keep you comfortable when you’d otherwise be absolutely miserable, as well as allowing you to fall asleep more easily without having a surface to lean your head on. In this article, we will discuss the advantages of taking a pillow with you on your next trip, various types of comfortable pillows, the materials they are made of, and where these portable pillows can be useful. 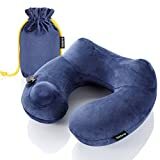 After that, we will review the top ten best travel pillows and end by giving you a buying guide, in case you haven’t yet made a decision on which travel pillow will give you the best night sleep. 2 What Is a Travel Pillow? 4 Why Should I Bring a Pillow? 5 When Should I Bring a Travel Pillow? 6 How Can I Get a Travel Pillow? In theory, a travel pillow is any pillow that you choose to take with you on a trip. In reality, a dedicated personal pillow is something entirely different. The world of travel pillows is almost infinite. As you will see below, they come in a variety of types and materials that are suited for any travel situation. These pillows will allow you to catch some shut-eye, no matter where you’re having to sleep or what kind of support you need. There are cervical pillows for supporting your neck and upper back, lumbar support pillows for your lower spine, and even pillows for total body support. There are basically three types of travel pillows. Each of them have their own advantages and disadvantages. When deflated, these pillows take up very little room. They are usually easy to clean. These pillows do take up more space. Memory foam and inflatable hybrid pillows do exist. These tend to offer the best of both worlds most of the time. Why Should I Bring a Pillow? When packing for your next trip, you should really consider packing a travel pillow among your necessities, and the reasons to do so are quite compelling. Having a pillow can make it possible to sleep on any surface, even across the seat of a bus if necessary. There are even specific pillows for side sleepers. Personal hygiene is important. When staying in a hotel, your pillow may not be the cleanest as though sheets and pillowcases are washed between visitors, the pillows themselves aren’t. For this reason, bringing along a pillow of your own can ensure that you don’t get sick. If you are camping, you don’t want to sleep on the ground. Though folding up a blanket or jacket can work in a pinch, it isn’t very comfortable. Stiff necks are a common problem on airplane flights and bus rides. These can persist for days or weeks after a long trip and can lead to an afflicted person needing a chiropractor or a session at the massage parlor. Inability to sleep on long trips can cause tiredness and grogginess when you need to be awake. If you wind up sleeping in the airport due to a delayed flight, you’ll need something comfortable to sleep on. When Should I Bring a Travel Pillow? The short answer to this question is that a travel pillow is always a good thing to bring with you. The long answer is that bringing a pillow is best for any extended trip where you plan on sleeping in unfavorable situations. However, travel pillows aren’t just for sleeping. As mentioned above, they provide a lot of support wherever you need it. Hotel pillows tend to be flat and not very supportive. Bringing your own pillow from home ensures that you will have the most comfortable sleep possible without having to either fold the pillow or use your arm as a surrogate which leads to numbness. If you are a bookworm, a pillow can be a perfect accessory since they offer the exact amount of support you need for reading. Never again will you have to worry about the stiff neck and eye strain that can accompany late-night literary perusal at the hotel. 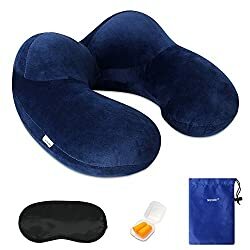 How Can I Get a Travel Pillow? Travel pillows can be bought in a lot of places. 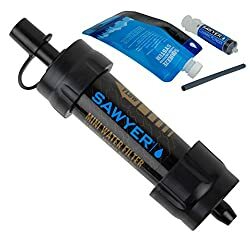 They are often sold at online retailers or local camping supply stores. If you are flying, you can even find them for sale at the airport. However, be cautious when buying pillows this way. Airport pillows can be much more expensive than ones bought from other places. When purchasing a pillow for your next trip, it is important to make sure that its quality is good, that it meets your needs well and that it folds or deflates to take up as little space as possible in your overflowing backpack or carry-on. Now that we have discussed the types, advantages, and places to purchase travel pillows, it is time to review some. These reviews will give you an idea of the best pillows on the market. When you have finished this section, you should have a good idea of the pillow best suited for your needs, lifestyle and travel plans. This inflatable pillow supports not only your neck but also your chin and the side and back of your head. This makes it the perfect pillow for those of you who often have your head bob forward and snap back while sleeping. Keeps your head and neck properly aligned. Prevents you from sleeping on your neighbor’s shoulder on long trips. Unique shape even supports your chin. It’s a bulky pillow. You can’t fold or deflate it. Do you want to feel like you are at the spa while traveling? If so, the Purefly pillow will be a welcome addition to your backpack or carry-on. Inflates with the push of a button. Simply push the button till the pillow is the desired firmness. Perfect for those who have asthma or other breathing problems that would prevent them from inflating a traditional pillow. Inflates in under a minute. 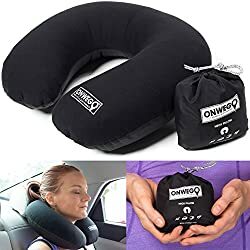 Amazing neck pillow provides soft comfortable support. Some units have problems holding air. Some users have found these inflatable neck pillows to be uncomfortable. 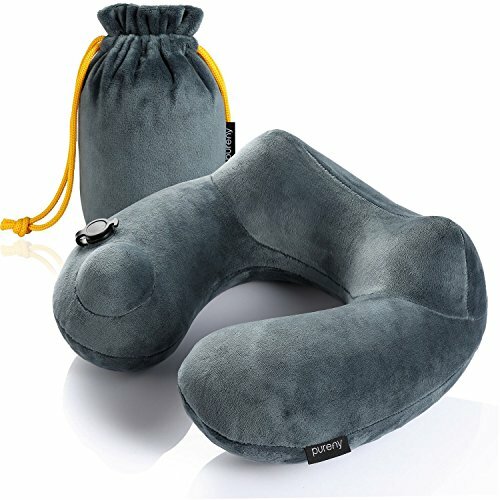 The TRTL travel pillow is the best pillow for neck and shoulder pain as it holds your head in the proper ergonomic alignment for comfort on any long-haul flight. Looks like a scarf but holds a hidden support panel. 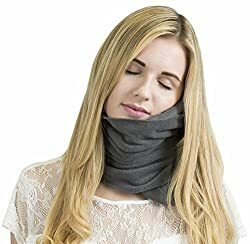 Keeps your neck toasty warm. You no longer have to lean your head on the plane’s headrest. Not suited for children under sixteen. Not comfortable if you intend on sleeping flat. If you are someone who does not sleep well on long trips, this pillow is perfect. It comes with an eye mask, ear plugs for when the children on the plane get rowdy, and a drawstring bag to tuck it all away in. Comes with eye mask and ear plugs for added comfort. Easy inflate mechanism makes this neck pillow perfect for any trip. Inflates in just a few seconds. Users with sensitive senses of smell may need to let this pillow air out a bit before use. This Travelrest pillow from High-gear design is a thermosensitive memory foam pillow with a cozy velour cover. Velour cover is easily washable. Nonskid backing prevents pillow from slipping. Pillow contours to the shape of your head and neck, making it the best pillow for neck support. Folds into a pouch that reduces it to one fourth its original size for easy travel. Like cuddling up with a body pillow, without the body pillow size. Only supports one side of your neck at a time. The AirComfy pillow is the perfect pillow for those of you who need amazing cervical and lumbar support without extra bulk. The center of this pillow supports the arch of your neck, making this one of the best neck support pillows. Inflatable but with great internal foam to prevent bouncing. Attach to your headrest with the included strap. Fold this pillow into the included pack sack and take it anywhere. Side wings keep your head from tilting. Adjustable inflation allows you to have just as much support as you need. This is an excellent backrest pillow as it provides lumbar support. Works well as a bedrest pillow for those who have been in the hospital and must sleep in odd positions for recovery. May be too big for easy packing in some carry-ons. Some units have leaky valves. 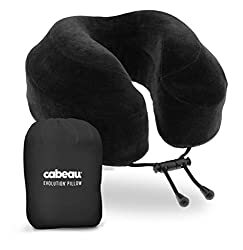 The Cabeau Evolution Travel Pillow is the best pillow for neck and shoulder pain. It has a flat back and raised supports, preventing sideways head tilt that can cause neck problems. Media pouch for holding your MP3 player for hands-free listening. Supports your neck, head and chin. Provides all-around comfort, no matter where you take it. Cover is soft to the touch and comfortable. Hard to use with over-the-ear headphones. No included cooling gel, so you might get warm while wearing it. 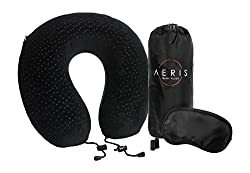 The Aeris pillow comes with an eye mask, ear plugs, adjustable toggles and a convenient carry bag. It offers you an oasis in the noisy world of a long plane flight or bus ride and then stows away nicely for easy packability. Excellent for chronic neck pain. Great for camping, reading, working at your computer or on a long trip. Stimulates blood flow and reduces restlessness. Machine washable cover is easily detached. Comes with ear plugs and eye mask. Different colors may be different softnesses. May be a bad idea for petite people. This push-button inflatable pillow will keep you away from germs. It’s also adjustable without having to be removed from your neck. Inflatable with the push of a button. May be too bulky for minimalists. Some units have defective inflation mechanisms. This wonderful inflatable neck pillow cradles your head without being bulky. It also packs into a tiny space. If you need light, compact comfort, this is your pillow. Will cradle your neck without being overly bulky. Really convenient. Easy to stow almost anywhere, including your glove box. Valve cover is very tight. Getting the last bit of air out can be difficult or frustrating. If you are planning on buying a best travel pillow, there are a number of factors you need to consider. In this section, we will go over these considerations. Hopefully, this information will guide you to the pillow that best suits your needs, no matter what those needs might be. If you are planning on taking a long trip, either on a plane or camping, you need a pillow that takes up as little space as possible. Pick a pillow that will easily fold or compress down into a small space. If you do this, you will be more than able to slide your pillow into your carry-on luggage and still have room for other things. After all, you don’t want to have a pillow that is so big that it’s the only thing you can carry. What kind of sleeper are you? Do you sleep on your back, your stomach or your side? Are you prone to neck or back pain? Are you planning on sitting upright for hours, or do you need a pillow that will allow you to sleep flat? There are pillows that will fit every need, including small bolster pillows if you need lower back support. Some pillows have unusual shapes. These are the best pillows for those who are going to sleep upright. If you are going to buy a travel pillow, you want one that is easy to clean. Pillows get dirty easily, and you want to be able to wash away germs. It isn’t any fun to sleep on a dirty pillow and doing so can be unhygienic. Choose a pillow with a cover that is easy to wash.
For this, machine washable covers are the best. It’s also a good idea to make sure the cover is easily removable. If you have allergies, be sure to read your pillow’s labels and tags. Not all pillows are hypoallergenic. It is important to choose one which will resist dust mites, mildew and other allergens. Some pillows have a scent. If you have a sensitive nose, it may be necessary to air your pillow out a bit before use. Buying a pillow with a washable cover can also help with this problem. You can remove the cover as the pillow airs and wash it, meaning your cover will smell like your laundry detergent as opposed to smelling like plastic. Some people prefer memory foam pillows or memory foam and inflatable combinations to just straight inflatable pillows. Inflatable pillows without the memory foam can feel hollow and bouncy. If you have ever slept on an air mattress while camping or at a friend’s house, then you know the exact feeling we mean. Inflatable pillows that do not include any memory foam are much like sleeping on one of those mattresses. These pillows provide a minimum amount of support. For that reason, most people need both inflation and memory foam if not just memory foam on its own. Another disadvantage of a pillow that is inflatable but doesn’t have the memory foam is that it can cause your head to tilt forward unnaturally. This unnatural neck position can lead to severe neck cricks and tension headaches that may persist for days or weeks after a trip. Some travel pillows are firmer than others. It is necessary to give them the squeeze test if possible. That way, you will know which one is firm enough for you. 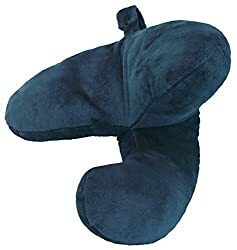 It is very disheartening to buy a nice travel pillow only to get home and discover that you hate it because it is too soft or too hard. Some pillows are also adjustable. These are perfect as you can adjust them to your specifications instead of having to figure out which is the softest or firmest. When buying a travel pillow, it is important to pay attention to its shape. Here are some common shapes of pillows and their advantages. U-shaped pillows support the back of the neck. However, they can allow the head to bob forward in an unnatural position. J-shaped pillows work like U-shaped ones, except they also support the back of the head, side of the head and chin. Wedge-shaped pillows are made to support your back, preventing those horrible backaches. Cylinder pillows are extremely versatile. They can support either your neck or back, and can be used to sleep lying down. Collar pillows go around your entire neck, much like the collars a person wears after a neck surgery only without the hardness. These give full support when you’re stuck sitting upright and not leaning to the side, as happens when you’re stuck in the middle seat of an airplane. Cushions are travel pillows in a traditional pillow shape. While not very good at supporting your neck or back, they are multi-purpose and will allow you to sleep flat. Travelrest pillows are shaped like commas. The curvy part goes over the seat, and the straight part is worn over your chest allowing you to rest your head that way. Skyrest pillows are shaped like big crates with slanted tops. They sit on your lap and you rest your head on them. This can lead to back strain. The type of material your travel pillow is made of is very important. For inflatable pillows, the material is a coated plastic generally. This may be really uncomfortable against the skin, so it’s important to buy a pillow cover if your chosen pillow doesn’t have one. Where non-inflatable pillows are concerned, the variety of materials is larger. Foam pillows are popular, but it is important to note the type of foam in your pillow as some last longer than others. Another common filler for travel pillows is beads, beans and pellets. These are good for support, but they can be heavy. Down pillows are lightweight but bulky and hard to clean. Polyester and cotton-filled pillows are comfortable, soft and easy to wash. However, they do not offer good support. Wool pillows offer the comfort of polyester, but keep their shape longer. They also last longer, too. 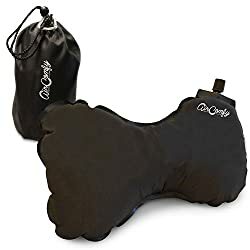 Having a best travel pillow on your next long trip can save you a lot of headaches, both physically and metaphorically. They are also good to have if you wind up sleeping in an airport or another place where a pillow isn’t readily available. However, a travel pillow isn’t just good for long trips. They are excellent pillows for around the house when working at your computer, watching a movie or reading. There are three rough types of travel pillows: inflatable, non-inflatable and hybrid, and they come in a variety of shapes. Each shape of pillow has its own advantages and disadvantages. When buying one of these pillows, be sure that it adequately meets all your needs. If you do this, you will sleep comfortably, no matter if you are in your own bed or on a red-eye flight. May all your trips be comfortable and may all your dreams be sweet.